Explanation: A fourth moon is visible on the above image if you look hard enough. First — and farthest in the background — is Titan, the largest moon of Saturn and one of the larger moons in the Solar System. The dark feature across the top of this perpetually cloudy world is the north polar hood. 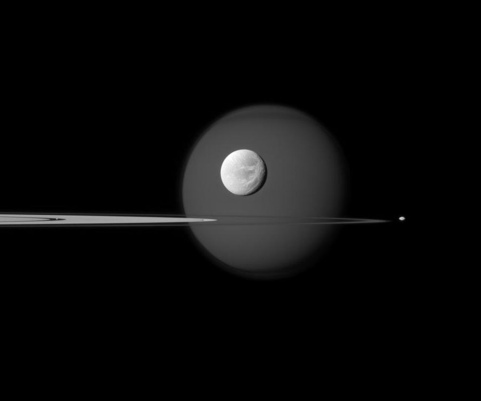 The next most obvious moon is bright Dione, visible in the foreground, complete with craters and long ice cliffs. Jutting in from the left are several of Saturn’s expansive rings, including Saturn’s A ring featuring the dark Encke Gap. On the far right, just outside the rings, is Pandora, a moon only 80-kilometers across that helps shepherd Saturn’s F ring. The fourth moon? If you look closely in the Encke Gap you’ll find a speck that is actually Pan. Although one of Saturn’s smallest moons at 35-kilometers across, Pan is massive enough to help keep the Encke gap relatively free of ring particles. As you’ll note in the side bar one of my favorite sites is APOD Astronomical Picture Of the Day, the above picture from Saturn is from the APOD. the single largest segment of memory on my iPad is devoted to these pictures. I understand that a human’s limited senses would not see these views but they still haunt me with their beauty and inaccesibility. Here is wonder and beauty we cannot destroy. Have to admit I’m a mite disappointed in humanity right now…hence the mooning over moons. We have a huge amount of capability and mountains of resources at our finger tips but we seem to have lost the magic sauce of leadership. I don’t know if we (humans) are going through a phase change right now or just hitting a rough patch or perhaps we have reached Lemming Stage (too many people period and some deep programming sets us at a metaphorical run towards the nearest metaphorical cliff.) I hope it’s no LS just a rough spot in the singularity….whatever that turns out to be. This entry was posted in Future, Space and tagged Space by Sci Fi Engineer. Bookmark the permalink.